Today we have the last in our series of interviews with the Unfit Dads. 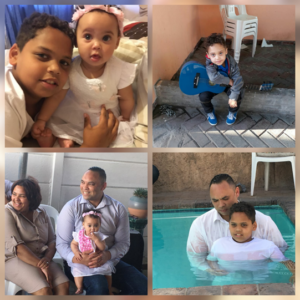 We have the privilege of introducing Andrew Van Der Walt, who is passionate about encouraging all “Unfit Dads” to create change that will be a benefit to their families and communities. Andrew: Andrew van der Walt is the name, continuous improvement is the game. I am 36 years old, married to one wife and share the joy of parenting 3 gorgeous kids – Nicholas (10), Stefan (4) and Bethany (10 months). My day designation is an accountant for Red Bull South Africa Pty Ltd, while interacting and serving various churches through J-Life South Africa. IESA: What was your experience of school growing up? Andrew: I loved school – for me, school was cool. Sometimes I wish that I could go back. Education is an important value drilled from a young age. This became a reality when my mom decided to disconnect our M-Net so that I could attend a good high school. It came with the opportunity to learn from excellent teachers and having the opportunities to grow. IESA: Have you yourself ever experienced exclusion yourself – what does the words Inclusive Education mean to you personally? Andrew: Exclusion – yes for sure. This is very much linked to the feeling of rejection. This is a deep emotion that many times children and adults should not experience or could avoid. I guess bringing it back home, it would be the negative effects of cliques had and maybe still has. Inclusive is the opposite – it is the place; time and moment when we make everyone know, understand and be inclusive. Inclusive Education South Africa provides this touch, it goes beyond boundaries and helps communities and this country with the support and training of various stakeholders be the very change for inclusion wherever they are. Andrew: Family and faith are high on my priority and discharging my duties and responsibilities have been hindered by an unhealthy lifestyle. I am diabetic. With my current running plan, my doctor has advised that I could be off my diabetic meds by end of the year with further weight loss being the goal. Therefore, exercise and running have given me the strength to be a better and active father and fulfil my heart and passion in servicing the church. It has changed my life in the sense; my eating patterns have changed, as well as what I eat. Running is literally changing my life. Andrew: IESA provides a unique service to South Africa and we need greater awareness of such wonderful initiatives. Therefore, my goal for getting involved is to raise funds and raise awareness so that when someone sees exclusivity within education, they will think of Inclusive Education as a solution. IESA: What are you hoping to achieve through this campaign? Andrew: The term “UNFIT DADS” is a play on words – I am hoping that many unfit dads in all areas of their lives take up the challenge of becoming an “UNFIT DAD”. Fathers, family and friends all around becoming fit. Andrew: I speak this to myself as well…Man up, take responsibility and love your wife and children unconditionally. Andrew, along with our other unfit dads, needs 21 sponsors to donate R 100 each in order to reach his target of R 2100.00 If you would like to support him, please go to www.givengain.com/cc/3unfitdads/ to support the cause.